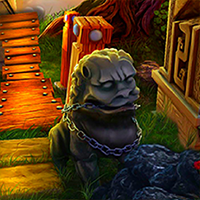 AVM Escape Statue House is another point & click escape game developed by AVMGames. It's unbelievable, but you have a very strange job: you are known as an art thief, but you are much more than that! People are having trouble with family members when it comes to an inheritance, and you help them get back what they deserve: this time, you were hired by a man to return a valuable and beautiful statue which was taken away from him. That statue reminds him of his father who passed away, and he wants it back at any cost! So you will have to get inside this secure house, find that statue and escape with it. Find clues and hints which will help in your mission and don't give up until you get back the statue. Good luck and have fun! The 2-1-3 slider is already solved. AVM apparently takes no pride in their work. Ditto the puzzle in s6. My 2-1-3 slider was not solved, but the colour barrel was. Half right! I liked how you had to combine a couple clues!